But what about justice for Zimmerman? I keep thinking of an episode of the 1973 TV show, "Kojak: The Marcus-Nelson Murders." Homicide detective Kojak suspects that the black teenager accused of murdering two white girls is being framed by his fellow detectives. For example. Clearly, the individual mandate in Obamacare is unconstitutional. And yet, Obama believes he can bully the Supreme Court to rule in his favor because "he" believes the mandate is a good thing. Ponder that folks, the president is pressuring U.S. Supreme Court justices to bend the truth and the law to suit his desires. Obama, the president who would be King. For years, Democrats have been trying to abort the thorn-in-the-side stumbling block to their socialistic agenda known as the U.S. Constitution. Who could have imagined deceiving the American people into putting a black Trojan Horse extreme left liberal into the Oval Office would "Git-r-done"? If Obama successfully forces U.S. Supreme Court justices to succumb to his politically correct interpretation of the law and rule Obamacare constitutional, setting such a precedence could mean so-called "white Hispanic" George Zimmerman is toast. It would mean facts, truth and the law are no longer relevant — only what the people/mob want rules the day. Regardless if the evidence proves otherwise, Zimmerman will be found guilty of "something" to avoid riots in the streets. We are talking political correctness on steroids. "Ima kill Zimmerman myself *loads semi* where he at"
"I think imma personally kill George Zimmerman...anyone's welcome to join (: ...Leggggoooo !" "Someone pass me a gun, imma go follow zimmerman, shoot and kill him and say #imstandingmyground"
"They let Zimmerman free lets kill that MF"
"George Zimmerman Released From Jail 150,000 Bail! WTF! Ni**a You Are About To Die, Start Writing Your Will!..." 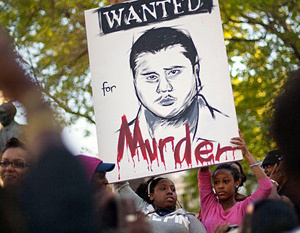 Have you heard the slightest hint of media outrage over the threats on Zimmerman's life? Have you heard any rebuke or threat of the Obama administration taking action against these thugs? Oh I know, they are still busy investigating Ted Nugent for passionately encouraging voters to "vote" Obama out in November. But seriously folks, the media and Obama administration's passivity regarding the threats on Zimmerman's life is shocking and should be an eye opener to us all. Anyone on the left's excrement list can expect no justice and no peace.